‘Rolling River’ is first and foremost a ‘texture piece’ – a keyboard texture to be played simply for the enjoyment of being carried along by it. 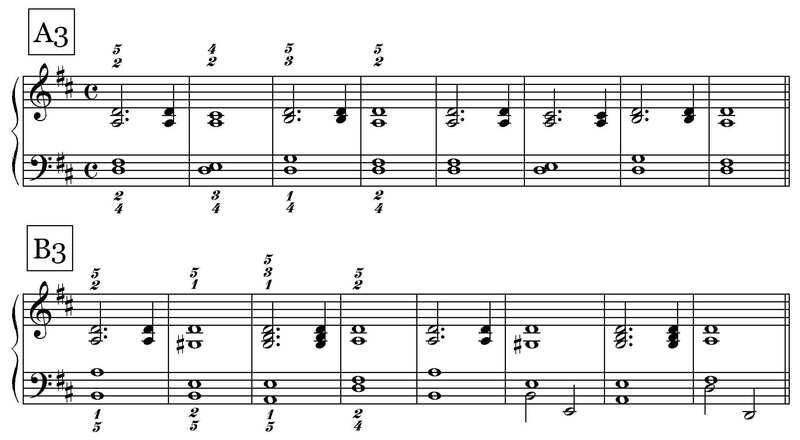 The cross-rhythm between the twelve-eight time signature and the implied three-four meter in the melody (see section below) encourages a floating, sliding-away sensation. Here is the performance video. ‘Rolling River’ is in twelve-eight (12-8) meter. The audio clip – which includes a spoken count – is at practice speed. Try to build an ability to count along to your playing and tap the main counts with your (left) foot. 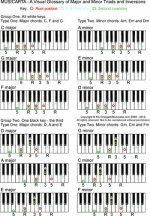 Analysing and saying the count out loud is sometimes the only way to master rhythmically complicated music. 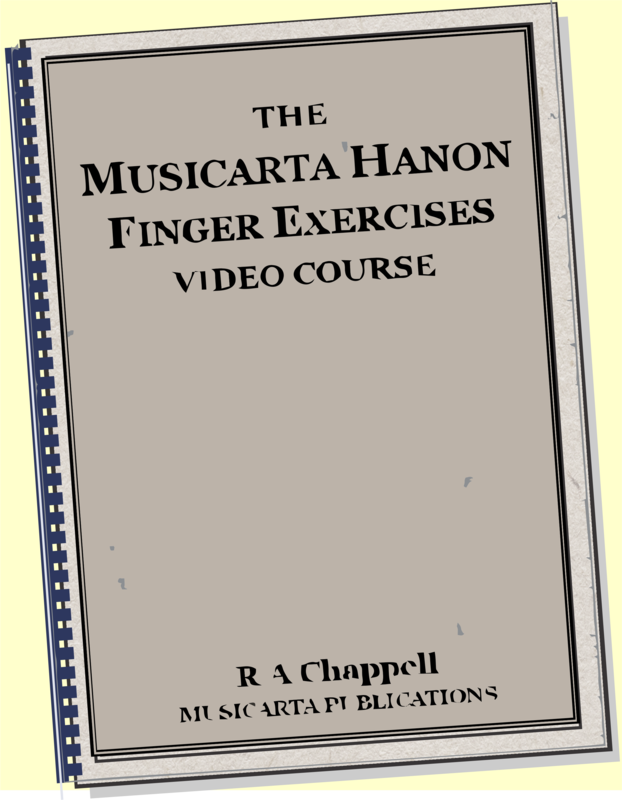 Finger technique for Rolling River is ‘sticky’ – the fingers should hold the keys down unless coming up to re-play a note or move to another one. The A7,11 chord in Rolling River looks like a G major triad over an A bass with E as the melody note, usually. Note that the 7,11 chord suffix implies an added 9tth (here note B). The chord could equally well be indicated A7,9sus4. There are small developments in the pattern throughout the piece, which keep it from getting stale. The original G/D chord (bar 5 and on) is re-cast from bar 26 on. 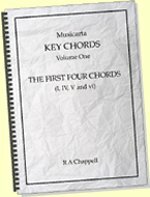 The A7,11 chord in the A1 phrase uses the B note in the accompaniment but from A2 on, the D is used. 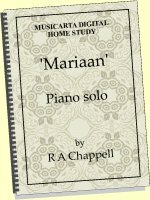 Check the MidiPiano performance for specifics. 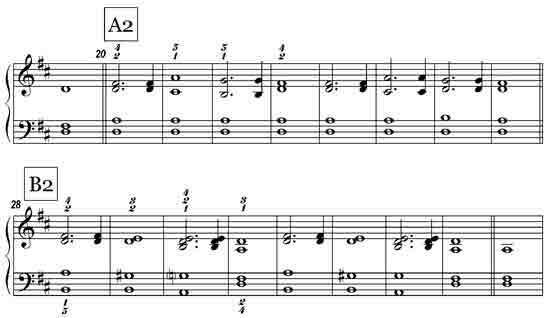 The last pair of quavers in a group or in a bar – “(2)-and-a” or “(4)-and-a” – sometimes go down instead of up, either because there is a melody note, or simply for variety. The ‘just for variety’ instances are indicated in the skeleton music with a small downward slash. 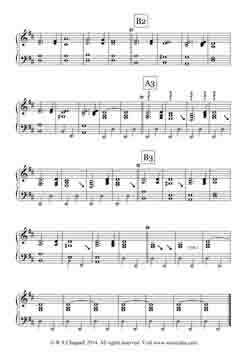 The insertion of single bars of accompaniment varies the phrase length (bars 19, 36, 69). 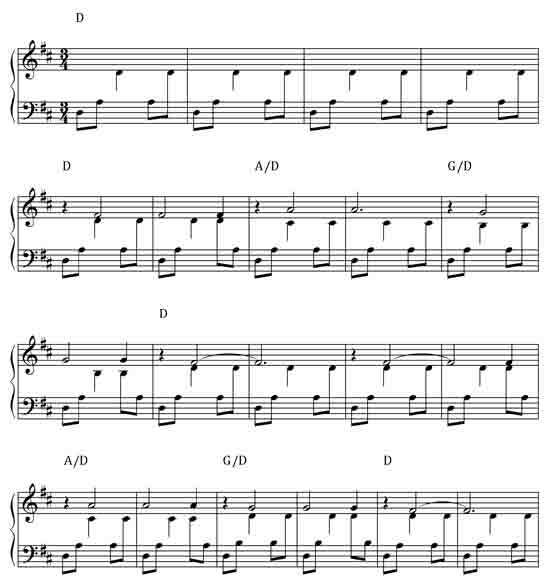 The skeleton music shows only the chords to which the keyboard texture is applied – reflecting the pattern-based thinking of the creative keyboard player. For neatness, the skeleton music is written in four-four. The upper stave again shows the right hand notes and the lower stave the left hand. 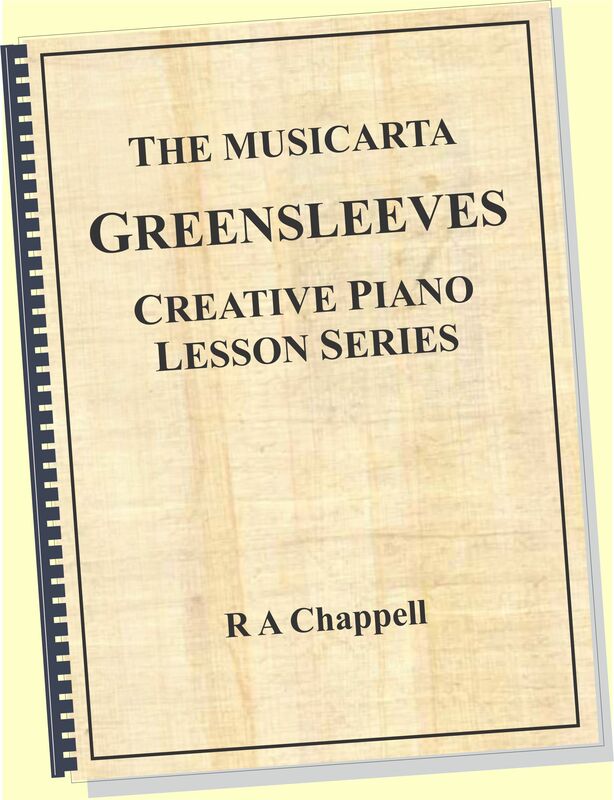 The MidiPiano performance on MisterMusicarta YouTube also colour-codes the hands green for left and orange for right, so you can always work out which hand plays which notes. The A1 and B1 strains (bars 3 to 18) have the simplest textures. 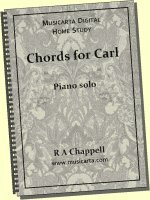 The top note of the chord is the melody note. (You will make it noticeable by ‘leaning’ on it to increase its volume.) The other three notes of the chord provide the accompaniment pattern (shown in the first MS example). 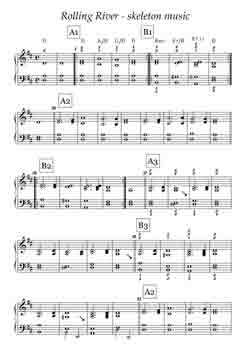 The melody note plays with the first right hand note of the accompaniment pattern. The A2 and B2 strains have a repeated melody note. 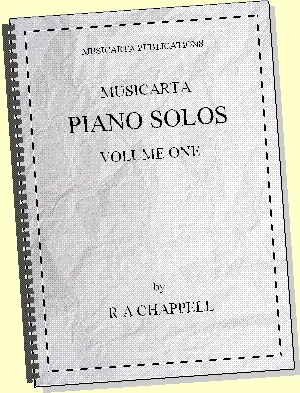 The second melody note in the bar – where there is one – comes two quavers from the end. This means the last two notes of the accompaniment pattern have to swap places and play top-bottom instead of bottom-top. The upper triads in the A3 and B3 strains are the A2/B2 chords taken down one inversion. A3 and B3 strains always have the repeated melody note. The B3 strain introduces the alternating octave bass, which requires one more of the accompaniment notes to be played by the right hand. Part of the attractiveness of Rolling River is the tension between the twelve-eight time signature and beat and the fact that the right hand sounds like it could be in three-four. Here is the Rolling River texture actually written out in three-four. The audio performance slips back into 12-8 for a B2 strain (listen to the bass drum beat), then alternates between 12-8 and 3-4. If you can feel both at the same time or alternate between them in your head as you play, both you and your audience will have a marvellous sensation of ‘swimming in the rhythm’. Playing the last two quavers in a group of six – the “(2)-and-a” and “(4)-and-a” quavers – increases the feeling of three-four. Tapping the foot or feeling the beat on only counts one and three of the twelve-eight bar has the same effect. for your personal study use. Do you enjoy learning keyboards like this? Musicarta has released three digital home study packs designed to structure your efforts, maximise your progress and give a boost to your creative music-making!